Next, Maybe A Voice-over Role In the Next Pixar Feature? So I went ahead and listed my lovely (if I do say so myself) phone voice in my birthday post (#34), and fame came a’callin. 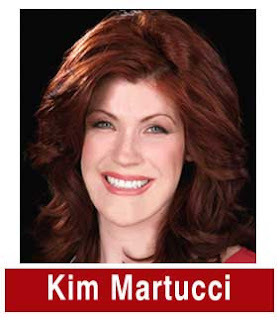 Alright, fame’s name is actually Kim Martucci, otherwise known as “Weather Kim”, otherwise known as the meteorologist for WUSA-9 in Washington DC, otherwise known as a frequent Suburban Scrawl visitor. Kim needed somebody to record her outgoing phone message. I’m not sure why; Kim has quite the lovely voice herself. But far be it for me to say no to my public (I hope you’re laughing as hard as I am about the idea of me having a “public”), so Kim and I negotiated…and negotiated…and after oh, about 30 seconds, we agreed on a non-monetary form of compensation: mutual blog posts about the recording. She sent me her phone number (jealous? ha ha: I can’t give it to you; it’s a secret!) (#39) and the password, and because of the fact that I’m smart (#12), I wove my way through the automated system and was able to record the message I wrote for her (#13 & #14). Wanna hear it? Check out Kim’s blog post, here. I LOVE IT I LOVE IT I LOVE IT!!! But it was YOUR birthday and I got the gift! I’d offer to bake you a cake, but I usually can’t get past just eating the yellow #5 induced cake batter raw!! Melissa, you’re a HOOT! You’ve hit the big time! You know, the guy who did all the movie/TV voiceovers passed away this summer; maybe you can take his place? My word verification was “reaks”. You should sue blogger for millions for defamation of character, even though they tried to cover themselves by taking out the second e and putting in an a.
Hehe I am with Nukedad because I was thinking you should do the movie voiceovers now that the position is vacant. Are you available for answering machines and cell phone voice mail? I am kinda sick of my automated message. What do you charge? I LOVE YOUR VOICEOVER!!! IT’S FABULOUS!!! See, if you hadn’t turned 40, you might not be so famous as now! Oh how fun! Glad you fully recovered from your pitcher of birthday margaritas! 🙂 Good to see you! Next post: Have Your People E-mail My People; We’ll Do Lunch! Previous post: Get The Kleenex, Sally…"Someday" Is Here!